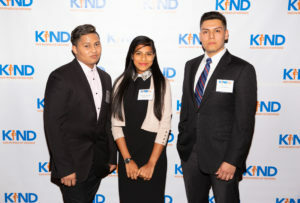 Nearly 400 attendees showed their support for unaccompanied immigrant and refugee children at KIND’s 10th anniversary Gala at the Mandarin Oriental in New York City on April 10. 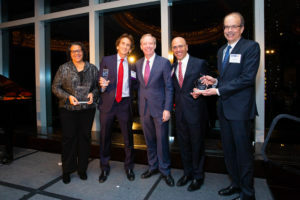 KIND was proud to honor K&L Gates LLP, O’Melveny & Myers LLP, and NBCUniversal, all of which have played seminal roles in ensuring KIND’s place at the forefront of the provision of pro bono legal representation to these children. 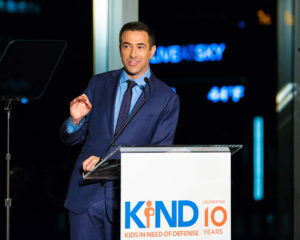 Ari Melber, the host of MSNBC’s”The Beat with Ari Melber” and MSNBC’s Chief Legal Correspondent, was the evening’s emcee. 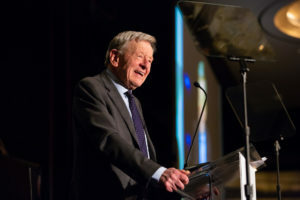 KIND’s featured speaker was Lord Alf Dubs, a member of the British Parliament, who was himself a child refugee and saved from Nazi-occupied Czechoslovakia by Kindertransport in 1939. 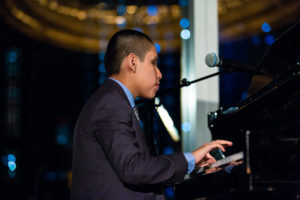 Three clients who received protection through KIND told their stories, and 13-year-old José André Montaño touched attendees with his piano performance, a unique mix of jazz, tango, bolero and blues for which he is well known. A supporter from the very beginning, K&L Gates received KIND’s Founders Award for going above and beyond in support of our shared mission. 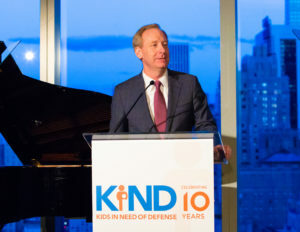 Since NBCUniversal began partnering with KIND in 2013, their attorneys have handled numerous cases in Los Angeles and New York, hosted intake clinics, and been an important corporate partner in efforts to extend corporate citizenship to pro bono legal representation for unaccompanied children—and the reason they were honored with KIND’s Innovation Award. 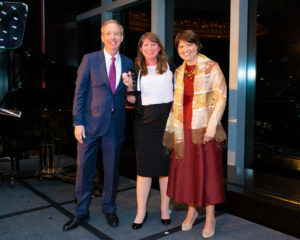 O’Melveny & Myers received KIND’s Allegiance Award for taking dozens of cases since 2013 and logging thousands of hours on unaccompanied children’s cases. The firm has hosted numerous intake clinics with a variety of corporate partners, which has helped KIND expand our relationships to new pro bono partners. KIND awardees with Board Chair Brad Smith. KIND clients (from left) Ismael, Alejandra, and Alex. Three extraordinary clients shared their stories with Gala attendees. Alex was being targeted by gangs in El Salvador and left at age 13 to find safety in the U.S. After high school, Alex was accepted into the prestigious “Year Up” program which provides college level courses and an internship at an American company to recent graduates. Alex interned at JP Morgan, which hired in him in January. Read his story here. Ismael fled Honduras after he was told by gangs that he would be killed for being gay. Ismael says he felt free for the first time in his life after arriving in the United States. He went to his first Pride Parade this year to publicly celebrate his new-found rights, and advocated alongside KIND on Capitol Hill last fall to help educate Congressional staff about the vital importance of protections for unaccompanied children in U.S. law. Read his story here. Only one year after arriving from El Salvador, Alejandra was nominated to represent her student body to create a service project to help her school community. As a victim of bullying because of her lack of English skills, Alejandra chose to develop an anti-bullying campaign. As a result of her work, Alejandra was selected to meet former First Lady Michelle Obama last year. She was recently accepted to George Washington University with a full scholarship. Read her story here. Lord Alf Dubs giving the keynote speech. As one of 669 children who escaped the Holocaust on trains from Prague organized by British stockbroker Sir Nicholas Winton, Lord Dubs later said he owed his life to Sir Winton and Kindertransport. All the other Jewish people Lord Dubs’ family knew who stayed in Prague went to concentration camps; the majority did not survive. As a Member of Parliament and director of the UK Refugee Council, he has been for years a strong advocate for immigrants and refugees. In 2016, Lord Dubs proposed an amendment to an immigration bill—the “Dubs Amendment”—which required the UK government to act “as soon as possible” to relocate and support 3,000 unaccompanied refugee children from other countries in Europe. As Lord Dubs said himself, “I was given the warm welcome in Britain years ago and we should still be offering this to child refugees.” Lord Dubs spoke about the dire need to do more on behalf of refugee children in Europe and around the world, and is a living example of unparralled commitment and dedication to this work. José André performing at the gala. José André Montaño began playing percussion as a toddler using cans and bottles in Bolivia. At three-and-a-half, he turned to the piano. At five he was in a formal Jazz Trio. He recorded his first album, AMA A TODOS at the age of 8, and by 12 had performed at Mexico City’s “Banamex” Theater and the Kennedy Center in Washington. Jose is now 13 and is hailed for his unique mix of jazz, tango, bolero and blues. [A link to his moving and enjoyable performance is coming soon]. KIND Board Chair Brad Smith presenting the Juan Osuna award to KIND staff member Juli Bildhauer with KIND President Wendy Young. KIND created and awarded our first KIND annual award in honor of Juan Osuna, KIND President Wendy Young’s husband who dedicated his professional career to advancing due process and fundamental fairness in the U.S. immigration system. He was former director of the Department of Justice (DOJ)’s Executive Office for Immigration Review, Deputy Assistant Attorney General of DOJ’s immigration portfolio, and a former Member of the Board of Immigration Review, to name a few of his accomplishments. The award is intended to recognize an individual’s exceptional commitment to the rights and protection of unaccompanied immigrant and refugee children and honor the often-unrecognized individual champions who advance KIND’s mission through their deep and demonstrated compassion for vulnerable children. The honoree will exhibit the attributes of determination, kindness and belief in fundamental fairness that made Juan such a powerful champion for the rights of immigrants. The winner of the first-ever Juan Osuna award announced at KIND’s Gala was KIND Legal Services Co-Director Juli Bildhauer. Starting in 2003, Juli led Volunteer Advocates for Immigrant Justice (VAIJ), which became the prototype for KIND, serving unaccompanied children throughout Washington State. In 2012, VAIJ became KIND’s Seattle office. Juli demonstrates a deep-rooted compassion for our young clients, making sure without fail that they feel supported throughout their immigration proceedings. You can still donate to protect children alone by texting KIND to 91999! Click here to watch video clips from the event.